We get a lot of press releases at The A.V. Club and many of them are strange, dumb, shameless, or some combination of the above. With Stop The Presses!, we share them with you. One thing we can count on here at The A.V. Club: sleazy press releases offering “experts” to comment on whenever a big story happens in the tabloids. When news of Justin Bieber’s arrest broke early this morning, it was only a matter of time before we were pitched our first expert, and right on schedule, the first one arrived at 10:37 a.m. central. Justin Bieber was charged with drunken driving, resisting arrest and driving without a valid license in Miami today. Bieber told police that he had consumed some alcohol, and that he had been smoking marijuana and consumed some prescription medication. The Opa Locka Florida police department in the Miami area is investigating a report that some of its officers escorted Bieber's caravan between Miami strip clubs this week without authorization. Today’s incident marks the first time the teen singer has been arrested, although he is under investigation on allegations of egging his California neighbor's home. There have been other complaints about Bieber in the past with no charges. Why is it that this talented star who seems to have everything is self-destructing? What are the causes? Where could he be headed? Able to discuss this and more is Evan Katz, a leading therapist and author of the book, Inside the Mind of an Angry Man. Katz says that Bieber is suffering from what he calls imposter syndrome, meaning that he has been living for so long in the expectations of what is expected of a star that he has been acting out against this expectation for years. He believes that unless Bieber gets treatment this behavior will accelerate into worse incidents and acts of violence. Katz has appeared on numerous shows for his expertise. Would you be interested in interviewing him on this? This Evan Katz shouldn’t be confused with Evan Marc Katz—tag on his website: “UNDERSTAND MEN. FIND LOVE”—who wrote a book called Why He Disappeared: The Smart, Strong, Successful Women’s Guide To Understanding Men And Keeping The Right One Hooked Forever. (He also offers seven-CD “audio series” called Finding The One Online.) He also shouldn’t be confused with 24 producer Evan Katz. No, this Evan Katz has can be found at theangerguy.com and features logos of those “numerous shows” he’s appeared on, like those on 1070 WINA and 100.5 KXNT NewsRadio! Justin Bieber was charged with drunken driving, resisting arrest and driving without a valid license in Miami today. Bieber told police that he had consumed some alcohol, and that he had been smoking marijuana and consumed some prescription medication. The Opa Locka Florida police department in the Miami area is investigating a report that some of its officers escorted Bieber's caravan between Miami strip clubs this week without authorization. Today’s incident marks the first time the teen singer has been arrested, although he is under investigation on allegations of egging his California neighbor's home. There have been other complaints about Bieber in the past with no charges. How serious is this to Bieber’s career? Will this hurt his brand? Can he recover? Able to discuss this and more is David E. Johnson, CEO of Strategic Vision LLC, a leading public relations and branding agency. Johnson specializes in crisis communications. He says the longer such actions play out the more damage it does to Bieber’s brand making him the subject of ridicule and a punch line. He says Bieber needs a comprehensive crisis communications strategy and the longer he waist the worse it could be for him. Johnson has appeared on CNN, CNBC, FOX News Channel, and CBS for his expertise. Would you be interested in interviewing him on this? Interestingly, this expert is the president of the company who was pitching on behalf of Katz. So are they sandbagging their own client? Then, at 12:41 p.m., came a press release on behalf of a numerologist yogi. Yoga, numerology, and Justin Bieber, together at last! Unless you live under a rock somewhere, you are probably aware that Justin Bieber was arrested for a DUI, drag racing and resisting arrest early this morning in Miami Beach, FL. 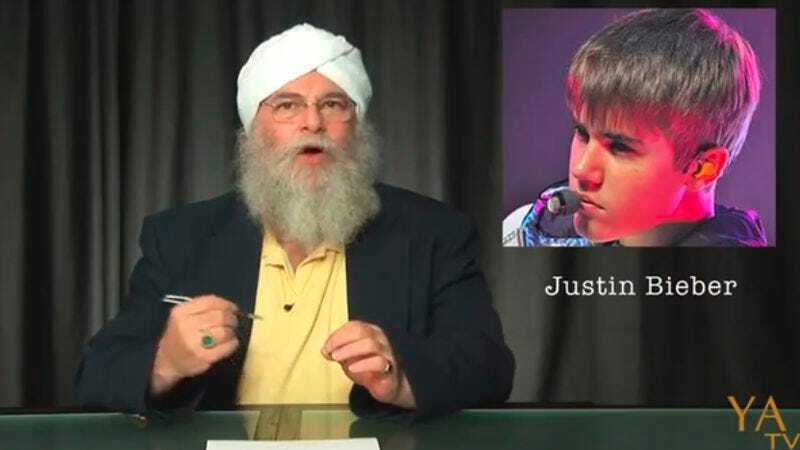 I’d like to introduce my client, numerologist Yogi Akal, who gave Bieber a forecasted reading in October of 2011 and was SPOT ON about Justin running into trouble with drinking and driving. I’d love for you to consider having Yogi Akal featured on an upcoming story or segment on his celebrity numerology process. Well, this press release is correct in one regard: In 2011, Akal posted a YouTube video directed at Bieber expressly forbidding him from drinking and driving. It’s almost like he predicted the future! He’s like a Canadian sikh Nostradamus, who maybe doesn’t pay employees! As much as the press release touts the yogi being “SPOT ON” about Bieber’s drinking and driving, it doesn’t tout that Akal also said that the “hardest time” of the pop star’s life is over. It seems like it could just be beginning, no? Again, that doesn’t seem to be the case, but Akal tweeted at Bieber today, just so the star knows his beturbaned pal is thinking of him.